Last night I had a hankering for a fruit smoothie, and I decided to swing by Equal=Grounds (750 South Ave., formerly Hunt's Hardware). I got a mixed berry with mint — ordinarily I'd go with blackberry with mint, but "mixed" is really black+rasp, so it was a pretty acceptable substitution. It was perfect: so full of flavor that any more would have been too sweet, and blended so smooth it all fit through the straw. Contrast that to tonight when I stopped by Starry Nites Café (696 University Ave., formerly Moonbeans) for a light dinner before the movie. Although the peach smoothie was acceptably flavored, the chunks of ice were too big to fit through the straw, leading to the unpleasantness of ice jams. I tolerated the ice jams worse than average because Ali had called that Lucy (the dog) was getting stitches after having been bit by a Rottweiler. The other dog had a sketchy past and had broke its collar; its owner was horrified and shaken. Lucy will probably be fine: she got bit pretty good in her front leg, but they managed to pull off the Rottweiler before it did any mortal damage. 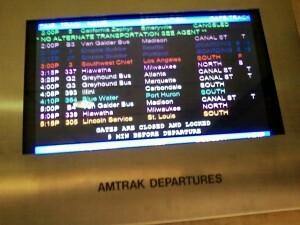 Thursday night I got to Amtrak (320 Central Ave.) about an hour early for my pilgrimage to Burning Man. Earlier in the day, I had to use a Zipcar to get my farm share from Mud Creek Farm (McMahon Rd., Victor), and to take Ali to pick up her car from getting brake repairs. Little did I know this was a mere warning shot of things to come. I had packed into two Rubbermaid totes, a large suitcase, a smaller bag, and a backpack. I made a custom cart to carry the totes along with the additional luggage tied on: the totes contained my to-be-filled water bottles, and the cart was to make it easier to navigate around Burning Man, particularly to get to a place to get a ride when I left. 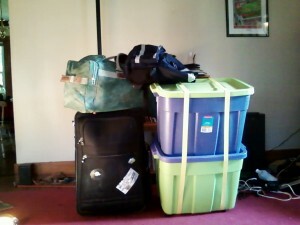 I was quite impressed as I ordinarily required the bulk of a car to carry everything I needed. While waiting for the train (which was an hour and a half late from Albany no less — that's three) I met a guy who was trying to get to Cleveland. He didn't have much (if any) money but he was going to try and sweet-talk his way onto the train. 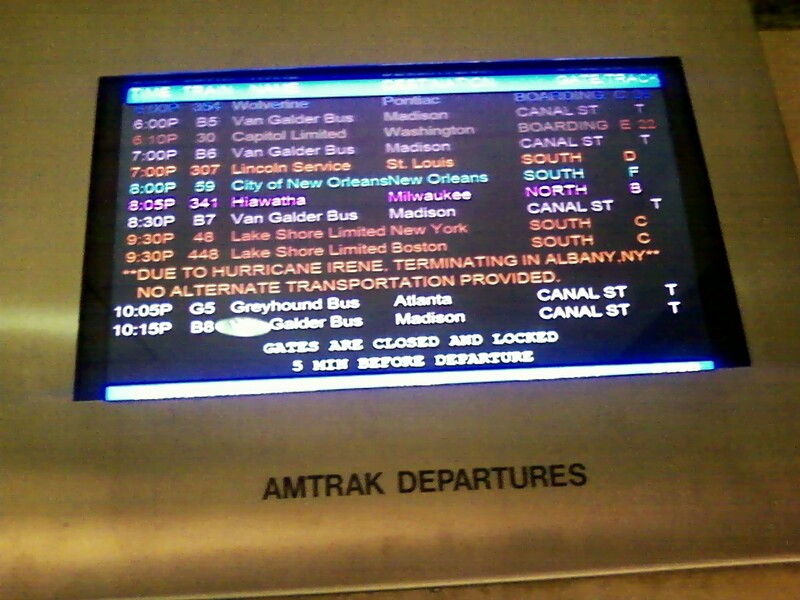 I was quite sure it wouldn't work, at least not on such a busy route — if it had been quieter, he would have been able to board without a ticket beforehand then at least made it to Buffalo before being kicked off. I looked into just paying for his ticket but it was too expensive so I just gave him a few bucks to see if he could make it to Buffalo or beyond. He went to the ticket counter then disappeared. Then when I was boarding, he reappeared and tried to be my "porter". Alas, he was indeed denied entry to the train. 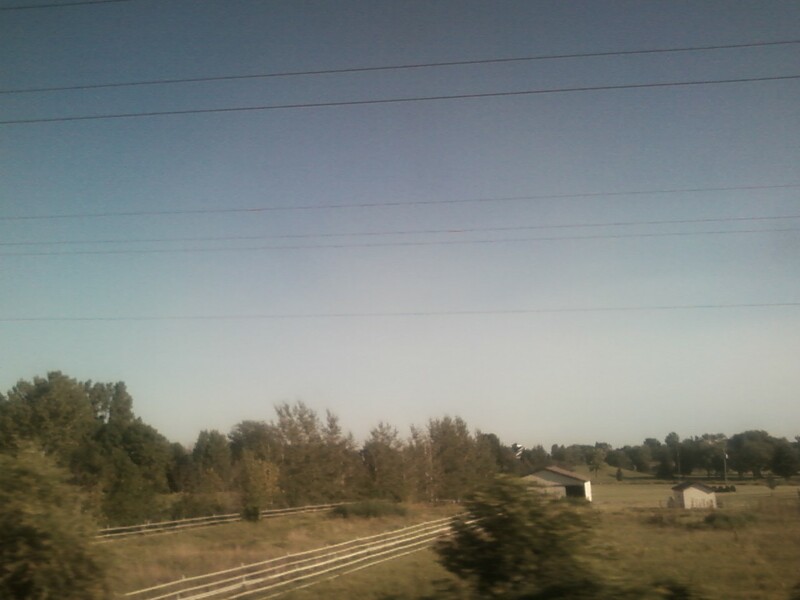 I finally boarded the westbound Amtrak Lakeshore Limited at 12:30 a.m. By 9 a.m. we were partway through Ohio. The moment I knew Burning Man was not-to-be this year. My jaw dropped and my heart sank as I read — as if a personal message to me about my whole trip — "Cancelled. No alternative transportation". That was when I really surrendered. Momentum allowed me to continue to the long line at the ticket counter as there was a possibility of leaving a day later — perhaps an engine had failed and needed to be moved. Alas the worst: the eastbound California Zephyr struck a piece of construction equipment and derailed, injuring 22 people. Service was not expected to resume for several days at the earliest. I was to meet some friends for a ride on Sunday to arrive on Monday when Burning Man started, so although I might have been able to figure out how to wait 24 hours, several days was out of the question (service was still disrupted as I write this, so at the earliest, I'd have left Sunday, arrived in Reno on Wednesday, then have to beg for a ride). Not to mention I couldn't afford to stay at a Chicago hotel for that amount of time, and it would disrupt my whole experience significantly. Cost prevented me from getting a rental car as well, and flying was not an option because of the amount of stuff I had with me. The mandatory American experience of taking a bus across the country will have to wait [for another lifetime]. So I exchanged my existing tickets and bought one to return to Rochester at 9:30 p.m. I also ran into two burners in the station (which I deduced from their fire-enhanced hula-hoops and fur-covered bikes). I didn't get their names, but asked what they were going to do. They opted to take the train to Portland, San Fransisco, and east to Reno, arriving a day and a half later. I probably could have done that, but like I said, I was getting a lot of signs to quit. I gave them my Burning Man ticket, and hopefully they could get it to someone who could use it (it might even help them get a ride). I got a little into Chicago but had to tote the cart of totes around so I didn't get far. I went to Beggar's Pizza (310 S. Clinton St., Chicago, IL) which was excellent. The Chicago style was so good that if it wasn't textbook-perfect, they should rewrite the textbook. For the remainder of the evening I hung around the station. I met a woman who came from Indiana to go to her brother's childhood friend's funeral in Iowa but she had to turn back too. And on "commiseration corner" of the fountain we also met a guy who went to boot camp for the Navy only to be rejected on a medical discharge and had to absorb the bittersweet experience of watching his campmates graduate in full dress uniform. 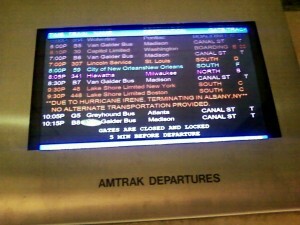 And even on the way home, things got complicated: Amtrak stopped service at Albany because of Hurricane Irene. Thankfully this didn't affect me because I only needed to get as far east as Rochester. 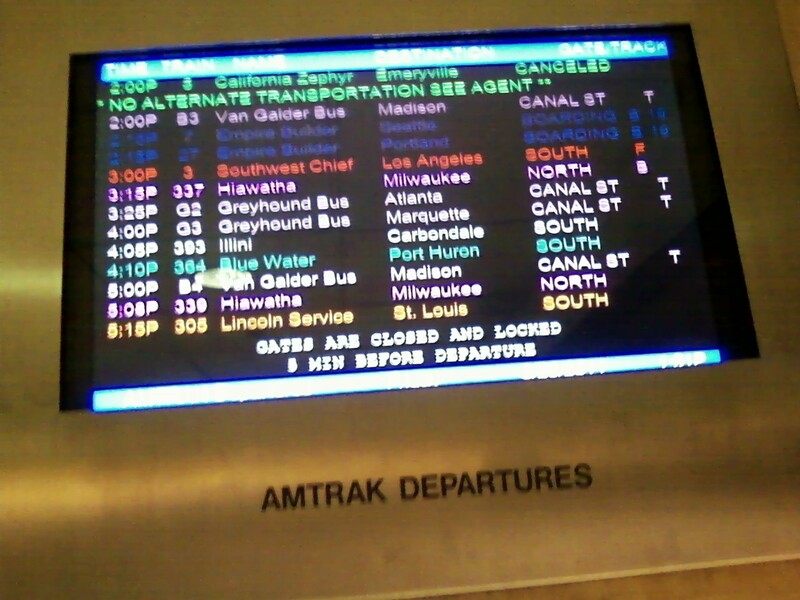 As things had gone, I fully expected them to suddenly stop service at Buffalo, though. Thankfully I was only going to Rochester! Obviously I'm really bummed. This was apparently the year of too-little, too-late. Earlier I had failed to get the Tadpole Trike finished on time. Then I hustled to get everything done to go by alternate means, but bigger and bigger roadblocks kept appearing. In both cases, I refer to a phenomenon I call "tractor-pull mode". In a modern tractor pull, a sled is used with weights over wheels that are slid forward causing the front to drag, so as Wikipedia puts it, "as the tractor travels the course, the weights are pushed forward of the sled's axles, pushing the front of the sled into the ground, synthetically creating a gain in weight until the tractor is no longer able to overcome the force of friction." Hence, the further I got, the more resistance I experienced. At least I can look forward to the things I would have missed in Rochester. And I can look forward to FrostBurn and put some effort behind it. In any case, next year I will be much more committed. Or else I'll need to be committed. Afterward I was going to head to Lux but I thought I'd check out 140 Alex Bar and Grill (140 Alexander St., formerly Nasty D's) as they changed names. There were only a few people outside so I was going to skip it, but I had to stop for the intersection and ended up talking about my tall bike with them a little. One of them mentioned I should go inside because Felipe Rose (the Native American in The Village People) was signing autographs. Well, as serendipity would have it, I had literally just listened (as in hours earlier) to a podcast of Wait Wait … Don't Tell Me! from April 10, 2010 which featured Rose as a guest. I went in and got to say hi and tell him about it. He was busy promoting a show at The Erie County Fair (5600 McKinley Pkwy., Hamburg) and was a little distracted, but thought it was kind of funny. Then I went to Lux Lounge (666 South Ave.) I was hanging out by the pool table for a bit when this guy comes in with one of the other new tall bikes around town! His name is Matt and he and some of his friends are working on custom bikes. Finally! It's not just me! Ali and I went to Rocco (165 Monroe Ave., formerly The Olive Tree) for dinner and it was fantastic. We dropped in without a reservation and were happy to eat at the bar. Ali got the ziti with a side of meatballs which she loved — if I remember right: I was overwhelmed by the quality of my thick-cut pork chop special with parmesan cheese and a chili-spiced red sauce. Drinks, too, were excellent: the Stormy Monday was a great choice. Ali even liked it despite that she otherwise hates the taste of bourbon. As it ended up, we were too full for dessert.